Fresh flowers show up in a half-dozen containers. Gingersnaps cover a fancy ceramic plate. A jar of mint-flavored water chills in the refrigerator. I read Mary Oliver’s poetry and thumb through a book of blessings. I write, doze and almost grab a flashlight – to sneak a midnight snack from the berry patch, a few steps from the door. Only an owl’s occasional hoot interrupts the low but electrifying hum of crickets as darkness thickens. What I can’t do is turn on a TV, hop on the Internet or use a cell phone. Playing a radio is possible, but it would feel like screaming in church. It’s so quiet that the flight of a single hummingbird in daylight sounds like a lawn mower run amok. Booking a stay at the three-room (as in kitchen, bedroom, sitting room) Fern Hollow Cabin, built in 1853, is one way to live off the grid in northeast Iowa. Bird chirps are my alarm clock. Ceiling fans do a pretty good job of moving humid air. The meal appears in a pleasant mismatch of antique and ordinary bottles, jars and linens. I eat at a heavy butcher block table, covered with a tablecloth of cross-stitching – the kind that fewer and fewer grandmas treasure. Scavenged handicrafts turn this secluded old house into a home. It’s about needlepoint and crochet; quilts and wood carvings. Add pottery and fine china, a fat hand-me-down library of books and games. Walking trails cut into a forest. A wooden swing, for two, overlooks a wide garden and wildflowers. “Built in 1853, revived in 1989.” This is how Liz Rog and Daniel Rotto describe the log cabin they lived in for 15 years, before renting it to travelers. Liz’s great-great-great-grandparents, Eivind and Ragnhild Fristad, raised six children in two rooms. Liz and Daniel dismantled the structure, moved it 12 miles and reassembled it on a brick foundation, to add the third room. Two daughters were born and raised in the cabin before the family built a larger house with reclaimed materials, just a few yards away. Liz says the land and its people, near Decorah, “speak to the deepest part of my soul.” She was born in the 1950s, raised in a Twin Cities suburb and freelances as a musician (she also managed Decorah’s Oneota Community Co-op for 25 years). Daniel co-owns a taxi service. Their life choices follow a Great Depression mantra: Use it up, wear it out, make it do or do without. That means buying used clothing, writing on both sides of paper, foraging for wild food and growing their own, turning recycled wood pulp into house insulation. Wealth is not a priority because the couple spots riches outside their windows: songbirds, sunsets, ripe tomatoes, just-picked corn. Solar panels provide all electricity. There is no well for water; whatever is used is purchased or collected rainwater. A Fern Hollow stay might realign your notion of what it means to be a serious steward of the land. It might reinforce your desire to conserve energy, or inspire life changes. Kitchen appliances are modern, but many mundane tasks of daily living require extra steps and thought. So head to the compost toilet outdoors, or use a chamber pot in the bedroom – but you’re responsible for emptying it later. Only cold water runs from the kitchen tap, so boil what you need for cooking and cleaning. To bathe, pour heated water into a bucket next to the shower stall, then flick a switch so the water can move and spurt from the shower nozzle. You think twice because of the extra time, the extra effort and the questionable necessity of each self-indulgence. For more about Fern Hollow Cabin, 1591 Manawa Trail Rd., Decorah, Iowa: www.fernhollowcabin.com, 563-382-8013. Cost is $107 per night, or barter down the rate with merchandise or labor. The cabin has one bed and a pull-out sleeper. Children are welcome. Within 10 miles of the cabin is a place of pilgrimage for lovers of heirloom-seed gardening. Inside the 890-acre Seed Savers Exchange heritage farm are many demonstration and display gardens that preserve the integrity of thousands of rare flowers, vegetables, fruits and herbs. About 25,000 types of seeds make up the nonprofit Seed Savers collection. The work began in 1975 with the seeds from two plants – the German Pink Tomato and Grandpa Ott’s Morning Glory – brought to the U.S. from Bavaria in the 1870s. Diane Ott Whealy, a Seed Savers co-founder, received the seeds from her terminally ill grandfather. Members of her international organization support the genetic preservation work on the farm’s certified-organic property. About 700 of the 1,300 members are agreeable to exchanging family heirloom seeds with other members. The farm’s garden for children aims to demystify food origins in fun ways, like by grouping plants by nation of origin. The preservation gardens show heirloom species in various sizes and shapes of garden plots. In the Historic Orchard are 700 of the estimated 8,000 varieties of apples in existence in 1900; the others are extinct. An Ark of Taste garden showcases a few of the foods deemed endangered by Slow Food USA. “Edible Asian Garden” is the theme of yet another plot. Elsewhere is a garden that demonstrates how much food can be produced in 100 square feet. Heirloom breeds of poultry and White Park cattle (on British Isles since before the time of Christ) also are raised on the campus. The fruits (and vegetables) of labor at Seed Savers go to a local school. Although miles of hiking paths exist at the farm, gardens are scattered throughout and sometimes not easily accessible to visitors. Gardens often are kept two miles apart, to prevent plant cross-pollination. Tours can be arranged. The visitors’ center, which includes a retail shop, is open from April through October. For more about Seed Savers Exchange, 3094 N. Winn Rd., Decorah: www.seedsavers.org, 563-382-5990. 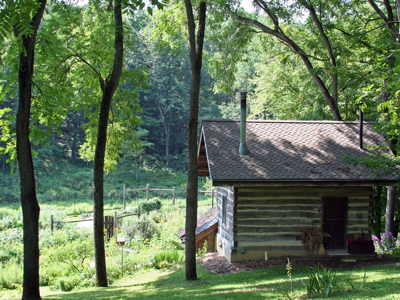 Fern Hollow Cabin and the innkeepers’ home is one of five off-the-grid home stops during the annual Decorah Dig-In, Aug. 21-23. A $10 ticket also allows visitors to tour Seed Savers Exchange, five other farms, a recycling center and Luther College (to hear about sustainability efforts, including biodiesel production for a fleet of vehicles; others run on electricity or natural gas). For more: www.digindecorah.com, 563-382-2023. A Fern Hollow neighbor is the Pepperfield Project, 1575 Manawa Trail Rd., a nonprofit effort that is devoted to rural life skills, including cooking, food preservation and gardening. For more about classes: www.pepperfieldproject.org, 563-382-8833. Co-founder David Cavagnaro is former gardens manager of Seed Savers Exchange. Also in the rural neighborhood: Waterloo Workshop, 369 Waterloo Creek Dr., Dorchester, Iowa, where basket weaving, wood carving and food preservation are done by Jill and Michael Stephenson in a log home that has no electricity or telephone. 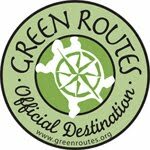 Want to patronize sustainable lodging operators, but not quite ready for the chamber pot or solar shower? New to Decorah is Cedar Dreams Inn, 521 W. Water St., two guest rooms (which share a bath) in a downtown building. Construction with reclaimed materials includes wood doors from a local school, sinks from the armory, flooring from a feed mill and wainscoting from another house. For more: www.cedardreamsinn.com, 563-387-6185.